height 7m, length 6m. Two cast bronze figures supported on heavy oak timber trestles and beams, with mild steel curve element. 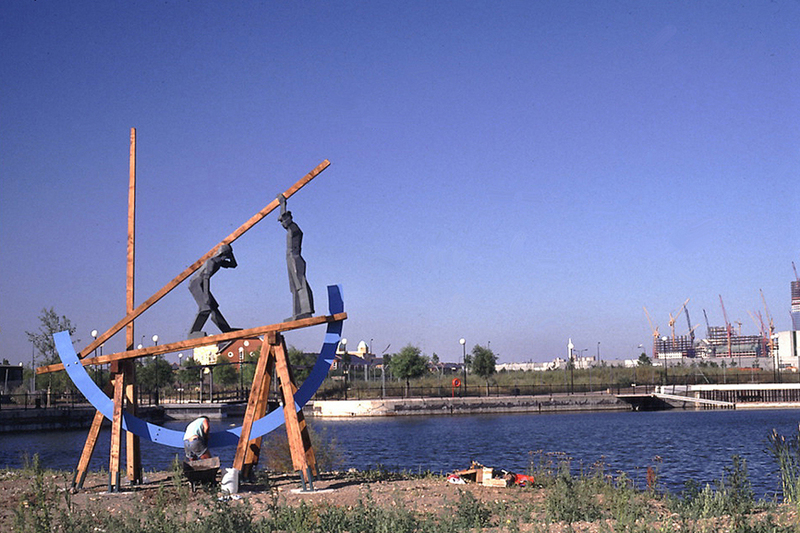 Sculpture set on concrete bases on landscaped island in water of former dock. The theme is based on the activities of the specialist dockers in this former timber importing point. The constructed wood figures were cast into bronze by Meridian Foundry. Steel curve fabricated by Hunt and Parker. Sculpture elements transported and assembled at the site by the artist with assistance from Callum Moncrieff.